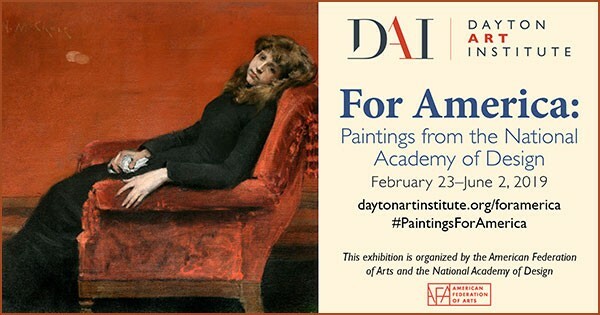 The Dayton Art Institute will be the debut venue for this major traveling exhibition, organized by the American Federation of Arts and the National Academy of Design. The Dayton Art Institute will be the debut venue for this major traveling exhibition, organized by the American Federation of Arts and the National Academy of Design. Founded in 1825, the National Academy of Design (known simply as the National Academy) has long been a leading artistic voice in America as an honorary artists’ society, school, and museum. This exhibition of 100 paintings by 79 artists tells the story of the National Academy, from the early 19th century into the 21st. It will feature masterworks by many of its prominent members along with portraits of several of the artists, since a portrait was a requirement for membership. Included are works by some of the most recognizable names in American art: Winslow Homer, John Singer Sargent, Maxfield Parrish, William Merritt Chase, N.C. and Andrew Wyeth, Thomas Eakins, Robert Henri, Ernest Blumenschein, Isabel Bishop, Richard Estes, Wayne Thiebaud, Peter Saul, and many more. Find more events like "For America: Paintings from the National Academy of Design"
Committed to enriching the community by creating meaningful experiences with art that are available to all. Visit us often to enjoy our diverse collections, world class exhibits and more.